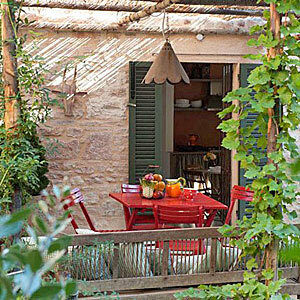 A charming indepedent house in the town of Spello, a little village in Umbria not far from the famous town of Assisi. Spello belongs to "Borghi più belli d'Italia" (the most beautiful villages in Italy), an association that comprises only the towns that have succeeded in preserving their monuments and artistic masterpieces in perfect architectural harmony, along with a quality of life that can infuse a new rhythm and taste into our times. Each May, the town celebrates the feast of the Infiorata where the streets are carpeted with pictures created by flowers. It is a remarkable event, and draws tourists from around the world. Restoration was completed on this house in July 2010 and is located just 20 meters from Il Sogno Dolci, the owner's first house. It is possible to rent the two houses for larger groups. Enter from the charming and quiet street into the foyer area where you can hang your coats and then walk across your private garden and open the French door to the open concept living/eat-in kitchen. From the living room a short hallway takes you to a bedroom with queen bed and doors opening to a small balcony and incredible views of the Umbrian countryside. Across the hall is a single bedroom and between them is a bathroom with walk-in shower. An amazing little house, with the best of both worlds - views of the countryside from the back of the house and gardens as well as a pretty view of the village street and rooftops from another window. Since you are in the village, the car can be brought to the house to drop off luggage but must be parked in one of the parking lots around the edge of town.